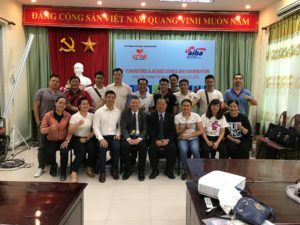 An important AIBA 1-star Referee & Judge Course is holding in Vietnam’s capital city in Hanoi during their National Women’s and Men’s Elite Boxing Championships. Sixteen participants including five ladies are attending in the AIBA 1-star Referee & Judge Course in Vietnam where their next generation’s of young referees are making their examinations during the national event. Two experienced AIBA Instructors as Mr. Wayne Rose of Australia and Mr. Paiboon Srichaisawat are the leaders of the AIBA 1-star Referee & Judge Course in Hanoi since November 28. The seminars have been separated into two parts, the first one was theoretic with a lot of presentations following that the second was introduced in the practical level. Vietnam Boxing Federation hosted the last edition of the ASBC Asian Confederation Women’s Boxing Championships in Ho Chi Minh City where their female boxers proved their strong potentials achieving gold, silver and bronze medals. Their Nguyen Thi Tam won the title of the flyweight (51kg) in Ho Chi Minh City one year ago. Vietnam’s male and female elite boxing team attended strong preparation events in Indonesia, in Bulgaria, in Thailand and in Mongolia and some other competitions but their main focus was the Jakarta 2018 Asian Games this season. Vietnam achieved one bronze medal in female boxing at the Games and the country is ready to get their first quota places for the Tokyo 2020 Olympics since their last attendance in boxing in 1988. Another important Referee & Judge Course is also holding for the AIBA 3-stars during the Golden Gloves Tournament in Nis, Serbia this weekend.